This version of the X-Dragon solar charger stands out from the other version that can be found on Google. It currently holds a 4.1 rating on Amazon and has many positive and neutral reviews, with few totally negative. Let's figure out what makes this solar charger so special. The X-Dragon solar charger is surprisingly small and light. It is just about as big as a smartphone, sizing at 6.1 x 3.34 x 0.79 inches and weighing just under a pound, at 11.8 ounces.It can easily be fit into a backpack, or even in your pocket. Since the size of the solar charger is small, the battery is also a bit smaller than other solar chargers we have reviewed. It has a total capacity of 10,000mAh, which is still considered a high capacity power bank. 10,000 is actually the minimal capacity that we recommend in our ultimate buyers guide for the top 10 best portable solar panels. It can still store enough energy to charge your smartphone multiple times. That battery can be recharged by the power of the sun or by plugging it into a wall. Also included are two USB charging ports. One at 5V/1A, which is fine for smartphones, and the second at 5V/2.1A which can handle bigger devices. Both of the USB charging ports have a built-in smart IC chip that allows the device to support any quick charge technology. The reason this particular version of the product is unique is because it has a foldable solar panel, that opens to give an extra two solar panels. While other versions only include the single solar panel on the front. All three are also premium solar panels, that are able to charge the power bank to 30% in just a few hours, with a full charge taking about 20 hours or less, depending on sunlight availability. Charging times may vary due to sunlight availability. 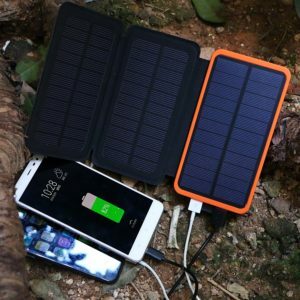 The availability of three panels instead of just one makes this devices much more efficient than other solar power banks. But of course, it still needs strong sunlight access. The charging will be much less efficient in cloudy days. The exterior of the X-Dragon solar charger is made from IPX6 water resistant leather sheath, which is a great addition as it will protect the sensitive parts of the device quite well. In addition, the rest of the body is made from ABS material which will protect it very well against any fall damage. Also the fact that the three panels are able to fold together means that the water resistant leather sheath faces out instead of the solar panels. Protecting them from all of the elements. Just be careful when they are unfolded and in use as the charging ports will be exposed. The X-Dragon solar charger has a lot of standard features that we have seen included in a lot of other solar chargers. It comes with a big LED flashlight, located on the back of the device instead of the bottom. It also features a carabiner hook on the corner of the device. This makes it very easy to unfold and attach to a backpack for constant solar charging while you hike. Also, 4 pilot LED lights are located at the top of the device to indicate the power level. Each light stand for 25% of the total power, which makes for quick gauging of energy. X-Dragon Industrial International Limited is a technology company which was founded back in 2010, based in Hong Kong, China. Their specialty is solar panels, bluetooth speakers and other accessories. On Amazon, they have a 99% approval rating from customers and offer features like 30-day money back guarantee for any reason and 18-month warranties. Customers seem to really love their products, as they have only received 1% negative reviews in the last year. Their customer service is also top-notch. The fact that the X-Dragon solar charger features two foldable solar panels definitely gives it an edge over the competition. The body and solar panel sheath are very durable and resistant to water and fall damage. Plus, when the panels fold together, the leather cover faces out instead of the panel, giving it extra protection from the elements. Dual USB charging ports is always a nice touch. Makes it easy to charge multiple devices at once. Though, two charging ports seems to be the standard among most solar chargers. The device is also very small, given that it has two foldable solar panels. When folded, it is the size of a smartphone, and about as heavy as one also. The body features a carabiner hook, so you can securely fasten it to your backpack, tent, pants, whatever. Solar charge with ease and without worry. The while the additional two solar panels to the original makes it more efficient, the solar charging is still heavily affected by the weather. Cloudy days will make solar charging much less efficient. For a good, reliable charge, strong sun availability is needed. It is not waterproof, only water resistant. So you may need to exercise caution when bringing it say, white water rafting. Do not let it get completely submerged. Rain should be fine though. The battery is the minimal size that we would recommend. While it will probably give you plenty of power, a bigger battery is always better. The X-Dragon solar charger certainly stands out from many of the other solar charger/ power banks we have looked at. While it does have a smaller battery, the solar charging capabilities are finally not a let down. They do their job fairly well, given appropriate weather conditions. Plus, usually lower price tags mean lower quality, but it seems that you will be getting a great quality product. Durable, efficient, powerful, and compact. Perfect for traveling. The X-Dragon solar charger came as a surprise to me. This is one of the first solar power banks I have reviewed that has very few negative reviews about the solar capabilities of the device. Might just be worth the money. Speaking of money, right now you can grab one for $25.99. Much cheaper than others we have reviewed, however you will also be getting a much smaller battery. All depends on what you are looking for. Here are some top questions that I found for people seriously considering buying the X-Dragon Solar Charger. How long does it take to charge the power bank using solar? 6 to 7 hours of good sunlight will bring it to about 30 or 40%. A full charge would take about 20 hours, given very good sunlight availability. What is the lifespan of the solar panels? The solar panels should be good for 20 years, with minor wear and tear. Can the panels charge during an overcast day? Yes, but the charging speed will be very inefficient. For optimal efficiency, abundant sunlight is needed.